Hugo Domínguez is a self-confessed pyromaniac. The Cuernavaca native has always been always fascinated with fireworks; he often played with fire as a child. And so Domínguez entered the pyrotechnics industry as a naïve 14 year old, moving from Cuernavaca to Tultepec, State of Mexico so he could pursue his mischievous passion. He immediately began learning the craft from veteran pyrotechnics makers in Tultepec, where a thriving cottage industry in fireworks dates back to the late 1800s. Domínguez worked in both legal and illegal workshops, where he would mix chemicals, roll firecrackers and stuff gunpowder into bottle rockets, known as cohetes. He also stared peddling fireworks, ranging from sparklers to Roman candles, at a crowded seasonal tanguis market for the pyrotechnics industry. Safety was always an afterthought.“I didn’t really know the risks … that the whole thing could blow up,” he said during an interview one recent afternoon at the San Pablito fireworks market on the outskirts of Tultepec, a municipality of 130,000 just north of Mexico City. But shortly after 1 p.m. on Sept. 15, 2005, the eve of Independence Day celebrations, one of the busiest selling days for the fireworks industry, the entire market exploded. Domínguez, still a baby-face teenager, vividly recalled hearing a rapidly growing crescendo of firecrackers as he was serving a customer. “I knew right away,” he said. He abandoned his stall and darted out of the market, which was flattened in mere minutes by an estimated 150 tons of exploding fireworks. No one died in the blast, but civil protection officials in Tultepec reported 128 injuries, including burns, bruises and broken bones. Merchandise loss totaled nine million pesos and 40 cars in the parking lot were torched. 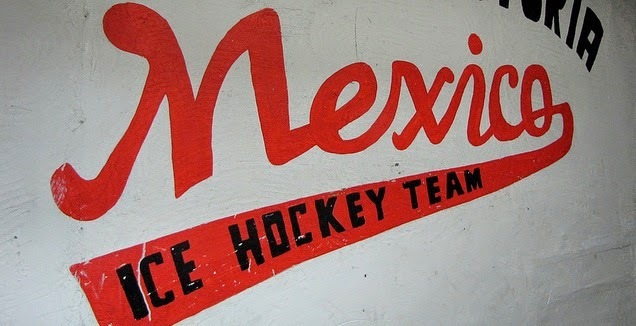 The blast’s origins remain uncertain, but the incident tarnished the reputation of Tultepec, which has become infamous for calamities stemming from the irresponsible handling and storage of gunpowder and fireworks. But the explosion also ushered in even more industry regulation as the Defense Secretariat, or Sedena, imposed new rules for boosting vendor, producer and customer safety. The new rules radically transformed the Mercado de Artesanias Pirotecnicos de San Pablito, where vendors previously occupied a single area full of small plastic stalls that were bursting at the seams with pyrotechnics. The market officially reopened in December 2005 with enhanced security precautions like a permanent firefighter base and weekly Sedena inspections. It now lacks electricity wire and phone lines – or anything else that could create a spark. A large sign at the entrance admonish customers not to smoke. Another tells drunken patrons to stay away. An orderly collection of 80 red and white brick huts with metal roofs now house 300 small pyrotechnics businesses, which are christened with colorful names like Pingüino, Miguelito and Danubio Azul. The huts dot a 5,000-square meter property and are separated by 11-meter-wide aisles crisscrossing the market. Each business measures nine square meters and is supplied with 200 liters of water, 100 kilograms of sand, a fire extinguisher, shovel and pick. Explosive merchandise must now be stored behind thick plastic display cases. But convincing the public of the new commitment to security has been difficult. Vendors at San Pablito report seeing fewer customers and experiencing diminished sales during the busy September and December sales seasons. “There still aren’t as many people as before,” Domínguez said. A Sedena rule limits customers to purchases to 10 kilograms of fireworks per visit, something Domínguez says state and federal police officers use a pretext for pulling over customers from outside the municipality. “The police are always hassling our customers,” he said. Javier Bolaños regularly patronizes San Pablito, where he buys sparklers and bottle rockets for traditional Christmas posadas in his hometown of Tultitlán, a municipality sandwiched between Tultepec and Mexico City. He says the new market is a vast improvement over the previous version of San Pablito. “Trips here used to be a really frightening experience,” he said while exiting the grounds with a bundle of sparklers slung over his shoulder. Many vendors also speak well of their new facilities – even if sales are slack.“[Customers] used to enter drunk, or they were smoking … they didn’t know the seriousness of this,” says vendor Lizdeth Campos Sánchez, who managed to survive the San Pablito blast despite being slowed while helping a pregnant customer to escape the area. Despite the risks, she says almost all of the vendors working prior to the explosion returned to San Pablito, which is open from mid July through Dec. 31. “This is what we know,” Campos Sánchez said. Each year on March 8, local residents fete San Juan de Dios, the patron saint of those working with explosives and fire, with a series of castillos, towering wooden-frame structures with spinning wheels that spew sparks and fireworks. The National Fireworks Fair takes place every November. 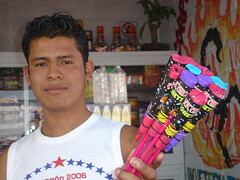 The percentage of the population making a living from pyrotechnics was higher in previous years, according to Campos Sánchez, who grew up in a family of fireworks makers. “We used to make bottle rockets on the kitchen table,” she said. Unlike several her siblings, who still make pyrotechnics, Campos Sánchez opted for retailing fireworks instead of dirtying her hands with gunpowder. Her shop, No. 143, hawks the standard assortment of locally-produced merchandise, including 50-peso bags each containing 500 firecrackers and 35-peso boxes of “chupacabras” that shoot off sparks and violently slither across the floor upon being lit. Business was steady prior to the explosion as Campos Sánchez averaged sales of 15,000 pesos per month. But those numbers tumbled by 70 percent after San Pablito reopened, she said. The Tutltepec government and Sendena moved many previously home-based fireworks makers to a 10-hectare farm on the outskirts of town in the early 1990s after a series of explosions. Regulations also gradually tightened over the years – especially after a 1998 explosion that claimed ten lives and damaged 180 homes. Legal fireworks makers – Antonio Urban Ramírez, director of the Tultepec government’s artisan promotion office says 551 licensed shops operate in the municipality – must purchase their supplies, including gunpowder, from Sedena. But clandestine workshops and sales outlets still persist, including several tucked away on a rutted alleyway mere blocks from city hall, just off Calle 5 de Mayo. On this day, a 13-year-old boy riding a mountain bike lured customers to the shops, which operate out of private homes where entrepreneurs are wary of answering questions about their operations. However, these unlicensed operators are becoming less common as the older generation of fireworks makers retires from the business, said Nacho Reyes, a Spanish-trained fireworks maker, whose hands and clothes were blackened with gunpowder. “It’s a lot of old-timers who don’t want to leave their homes,” he said of the clandestine producers. Neither Reyes nor anyone else interviewed in Tultepec criticize the new safety measures or crackdown on clandestine operations, but Domínguez, the young vendor, reminisced about the old days of lax regulation. “It’s safer now, but not nearly as much fun,” he said. Feliz Navidad, and since you are a guru of mexico, I am looking for some expert advice on this Tultepec Mexico fire work market explosion 8/15/200. I am working on a project for the Discovery Channel.